Ayaka Hamasaki was fighting for the belt and a lot more Friday night. Exactly five years ago, Hamasaki’s home country of Japan was hit with an earthquake and then a tsunami. More than 18,500 people either died or went missing. Hamasaki wanted to honor those victims on the anniversary of the date. It came through in the cage. 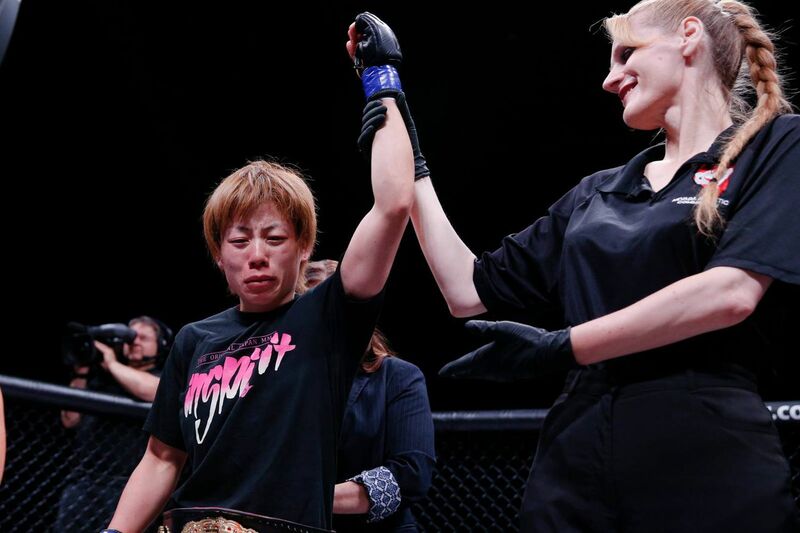 Hamasaki successfully defended her Invicta FC atomweight title against Amber Brown, via armbar submission at 2:52 of the third round in the main event of Invicta FC 16 at the Tropicana Las Vegas. The fight was back and forth throughout with plenty of ground scrambles. Brown nearly choked out Hamasaki with a triangle from the bottom in the first round and finished the second round in much the same way. Brown was likely up on the scorecards heading into the third and tried to take the fight to the mat again, since she was doing so well there. That time, though, it didn’t work out in her favor. Hamasaki used a kimura to sweep into top position, then transitioned into an armbar. Brown held on as long as she could as Hamasaki hipped into her and torqued the arm far back. Finally, as Hamasaki wrapped her legs around Brown shoulder, Brown tapped out reluctantly. Brown was clearly in a lot of pain. This was the first title defense for Hamasaki (13-1), who won the belt from Herica Tiburcio last July. The Japanese star has now won four in a row. Her lone career loss came against top UFC strawweight Claudia Gadelha. Hamasaki, 33, owns wins over Mizuki Inoue, Seo Hee Ham (two) and Lacey Schuckman.